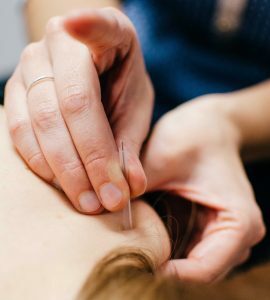 Intramuscular Stimulation (IMS) is grounded in Western Medical Science as a treatment, which utilizes acupuncture needles to specifically target injured muscles that have contracted and become shortened. The IMS treatment will allow the shortened muscle to relax and lengthen (as the muscle “grasps” the needle and then releases), thus initiating the natural healing process. Our chiropractors (Dr. Alim Kara & Dr. Shereen Kangarloo) and physiotherapist (Geoff Gerber) provide IMS therapy at CCST. The result is threefold: (1) a stretch receptor in the muscle is stimulated, producing a reflex relaxation/lengthening, (2) the needle also causes a small injury that draws blood to the area, initiating the natural healing process and (3) the treatment creates an electrical potential in the muscle to make the nerve function normally again. When combined with other soft-tissue therapies (such as ART and Graston) the effect of the treatment is amplified conferring a more effective overall result in healing.